This rich combination of cookbook and memoir tells the story of a family and the secrets of its kitchen in post-World War II Tuscany. Suffused with the scents of simmering pots of cacciucco - a hearty, local seafood stew - and the vibrant coastal blossoms, Patrizia Chen's childhood was centred in the sun-drenched kitchen and adjoining herb garden of the family home in Livorno, on the Tuscan seacoast. There, in a world struggling to recover from the devastation of the Second World War, Emilia, the cook, shared her craft with her young charge, while Patrizia's grandmother, Nonna Valentina, managed a household still containing chamber pots, sacks of chestnut flour and coal-burning stoves. Eccentric characters, aromatic dishes, white Carrara marble terraces and a magical garden come alive in a warm and humorous narrative. 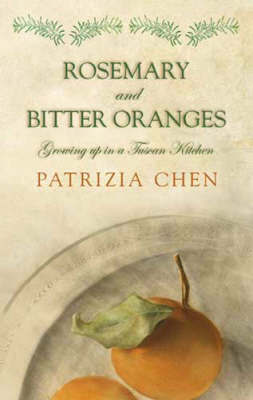 Rosemary and Bitter Oranges will captivate readers with its simple, delicious food and the author's wit and abiding love for tradition.